Interior design is a fascinating field that allows professionals to combine their creative skills with business sense as they interact with different clients and design functional spaces. With some growth projected for the industry being projected, this is the right time to consider a career in interior design. Interior designers design and create living and working spaces for a variety of clients either as part of a design firm or as a freelancer. Designers often specialize in a specific area, such as home design, green spaces, or corporate workspaces. Earn a degree – While it is not an absolute must to have a formal education, designers are required to hold at least a bachelor’s degree in most interior design firms. These firms prefer a degree in the very field in question, but you can also have one in another area as you have done some coursework in interior design such as computer-aided design and drawing. Associate, master’s, and doctoral level degrees are also available. You will find interior design programs at many major colleges and universities, and also in specialized art and design institutes. Approximately 300 post-secondary institutions with art and design programs are accredited by the National Association of Schools of Art and Design. Additionally, more than 150 professional-level interior design programs across the nation are recognized by the Council for Interior Design Accreditation, and design specialty programs at 45 colleges and universities are accredited by the National Kitchen & Bath Association. Pass the National Council Exam – It is not mandatory for interior designers to have a license in all states. However, there are several that prohibit unlicensed designers from working on interior design projects. There are other states that allow both licensed and the unlicensed interior designers to do interior design, but permit only those with licenses to use the “interior designer” title. To get licensure, you will need to pass a state-approved exam. Typically, the exam that designers need to take is the National Council for Interior Design Qualification exam. To be eligible to take the NCIDQ exam, you will need to have a combination of education and experience, typically a bachelor’s degree and two years on-the-job training. You can also consider voluntary certification in a specific area. Certifications in specialty areas are independent of the NCIDQ and you will find them through professional and trade associations. Work on Pro Bono Projects – If you are just starting out, you may find it difficult to get employed without any existing work experience. The problem is that you cannot gain experience without working. Many interior designers start out by honing their skills for free. You can offer your services to family and friends, or you could volunteer to help non-profit organizations or services in your area or even small businesses that cannot afford to hire a professional interior designer. Many new designers even practice their craft on their own homes. The vital aspect is to ensure that you develop the skills required when real jobs that pay come along. Build a Portfolio – Make sure that you take high quality photographs of all your work and compile them into making a professional portfolio. If you are seeking clients, the most crucial tool you have is a comprehensive, high-quality portfolio. This allows for potential clients to get a look at some of your best work. It also gives you the opportunity to showcase yourself in a well-organized and professional manner. In addition to photos, include a selection of your sketches and designs and be confident enough to present examples from a range of different projects. You can also maintain an online version of your portfolio – this gives potential clients easy access to portfolio and allows them to see your work. Seek Opportunities for Continuing Education – There are a number of certifications that you can undertake and stay abreast of changes and trends by attending conferences related to interior design. A number of institutions offer certifications in specialty areas including spatial theory, sustainable design, designing historic spaces, and corporate interior design. Regular events are hosted by renowned institutions such as the American Society of Interior Designers, International Interior Design Association, and the Interior Design Society. 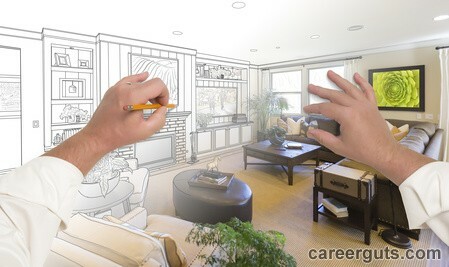 A career in interior design is an exciting option, especially since the job is well paying. According to payscale.com, interior designers earned a median wage of $24.00 an hour in May 2016, which was based on 40 hours a week, translating to an annual income of $49,920. The Bureau of Labor Statistics reports that as of May 2015, interior designers earned an annual median wage of $48,840. Professionals who fall under the 90th percentile category can expect to earn close to $90,000. As is the case in other industries, geographical factors, experience and the type of interior design projects also play a role in annual salaries. The highest median wage is earned by interior designers who work in the engineering and architecture industries. Becoming a certified interior designer is not as difficult as you may think. As mentioned earlier, you do not need high educational qualifications. A bachelor’s degree can get you into an interior design program in a stellar college or university. With adequate knowledge and experience, you can also obtain a certification fairly easily. Work experience, as you have seen, is not difficult to obtain either. You can work on your own home or friends and family’s and create a portfolio that displays the best work you have done. With your portfolio ready, you can get clients to give your interior design projects so that you can kick-start your career as an interior designer. You should definitely consider a career as an interior designer. It allows you to use your creativity and design and create beautiful spaces for homeowners and commercial buildings. This is a fine way to earn a living since it is intriguing and allows you to make property owners happy as you help them create the space they envision for their home or office.